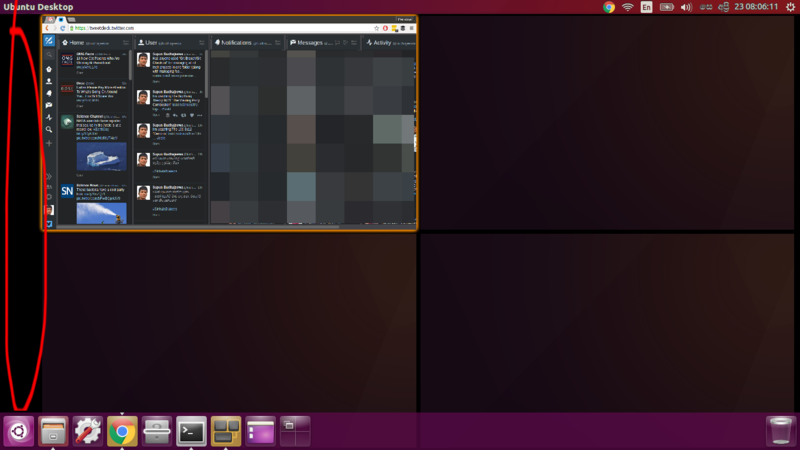 Workspace Switcher mode shows an empty space in left side, where the Launcher was previously located, when Launcher is moved to bottom. I've reported this in March as Bug #1562343. Accepted compiz into xenial-proposed. The package will build now and be available at https://launchpad.net/ubuntu/+source/compiz/1:0.9.12.2+16.04.20160526-0ubuntu1 in a few hours, and then in the -proposed repository. On what version of Ubuntu and what version of Unity. I just checked it on 16.10 and I don't have any gaps in workspace switcher. If you have gap on the right side of the screen you should open a new bug report. This as the title suggest was about gap on the left side. If you open a new bug report please specify the version of Ubuntu you are using and also Unity version. Try to determine if the problem occurs in a specific circumstances (the way to reproduce it).